A Peterborough martial arts specialist foiled an early morning robbery on his doorstep. Charlie Melia (27) was standing by his Land Rover preparing to drive to work when he was attacked in Belsize Avenue, Woodston. Charlie said: “There were a few fellas outside, even though it was dark. “I started the engine up, then my wife came out to give me my phone and tablet. I got out and was by the passenger door when I turned round one of the fellas was flying at me - he tried to punch me. “I managed to get out of the way, and I punched him. “The other men got into the car and drove off. After the car had been taken and the man Charlie punched ran off, Charlie’s wife phoned the police. Charlie said: “I have never been in a situation like this before. “I am a boxer, I do jujitsu and tae kwon do, and I thought I would be able to keep my head 100 per cent, but I was half asleep getting ready for work. A Cambridgeshire police spokesman said: “We were called at 6.55am on January 4 to reports of a car being stolen and an attempted robbery in Belsize Avenue, Woodston, Peterborough. “Whilst the attempted robbery was taking place, two men made off in the victim’s car, a light blue Land Rover Freelander. “The vehicle was later recovered in Eastgate, Peterborough, however the offenders are still outstanding. 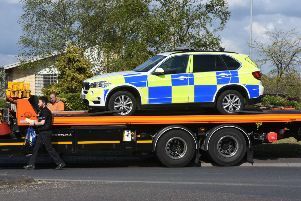 “A 22-year-old from Peterborough was arrested on suspicion of robbery. Anyone with information regarding the incident should contact police on 101, o rcall Crimestoppers, anonymously, on 0800 555 111.